I loooooove fennel. It’s such a weird vegetable — it’s white in color, has a core that needs to be removed, acts like a root vegetable (you eat the bulb vs. the plant that grows on top) and it tastes like nothing you would ever expect a vegetable to taste like — licorice or anise is the only way you can describe it, but it’s a mild version, not like biting into a piece of licorice. And then there’s the crunch you get. And on top of that, it’s so versatile! I’ve made dishes with fennel including a cheesy, rich potato fennel gratin, awesome salads, soups and roasted vegetables. It’s really awesome — you’ve got to try it. This dish — Fennel and Garlic Shrimp — is a great use of fennel courtesy of Ina Garten. It’s fresh, garlicky and makes an awesome pan sauce that you sop up with crusty bread. Plus, it cooks up super quickly, so it’s a perfect weeknight meal. Heat the olive oil in a large (12-inch) saute pan over medium heat. Add the fennel and saute for 5 minutes, until tender but not browned. Turn the heat to medium-low, add the garlic and red pepper flakes, and cook at a very low sizzle for 2 to 3 minutes, until the garlic just begins to color. Pat the shrimp dry with paper towels, add them to the pan, and toss together with the fennel and olive oil. Spread the shrimp in one layer and cook over medium heat for 2 minutes on one side. Turn the shrimp and cook for 2 minutes on the other side, until they’re pink and just cooked through. Off the heat, sprinkle with the parsley, 1 tablespoon of chopped fennel fronds, the Pernod (if using), the fleur de sel, and black pepper and serve it with bread to soak up all the pan juices. It’s not summer if you haven’t had grilled chicken! Am I right? This recipe takes your traditional chicken with BBQ sauce to the next level with an amazing roasted garlic-herb dressing. I took this from one of my favorite cookbooks ever — Tyler Florence’s “Tyler’s Ultimate.” I have so many favorites from that book it’s insane. This one didn’t disappoint either. I love this recipe because it’s pretty simple — there aren’t many ingredients, there’s not a ton of prep, and the end result is simple and delicious. 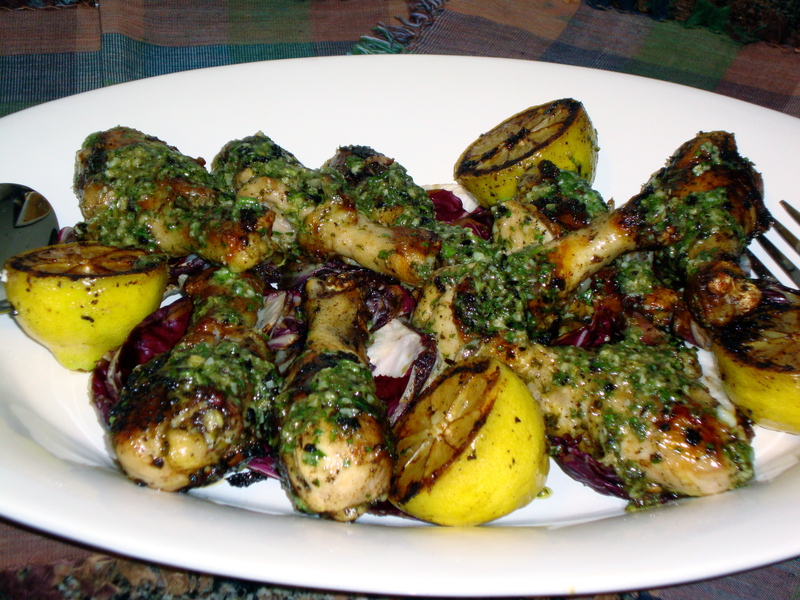 The chicken is super moist and topped with the garlicky herb dressing and a squeeze of grilled lemon, it packs a ton of flavor. 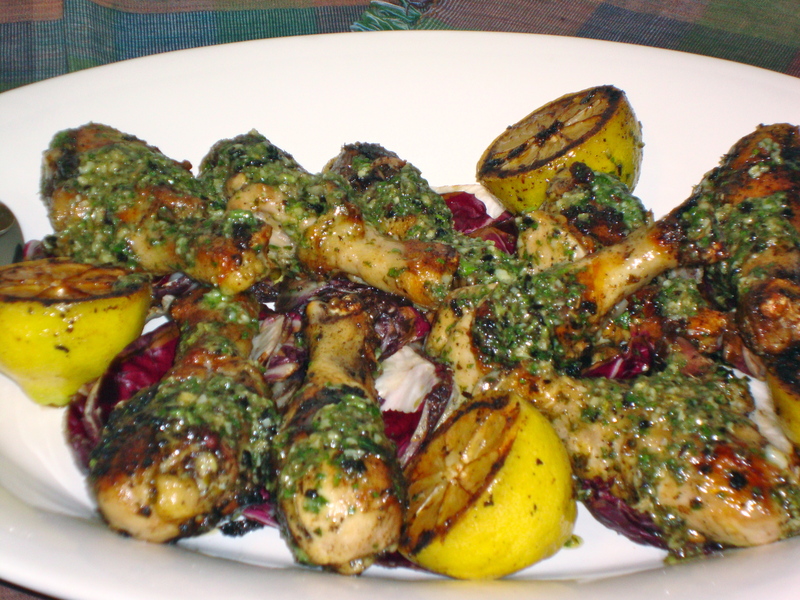 I’d never thought about grilling radicchio, but it’s the perfect accompaniment to the chicken. If you’ve never had radicchio, it’s a bitter leaf vegetable (technically chicory) that is typically purplely-pink (definitely a real word) and white in color. I love it, and grilled with a little balsamic, olive oil and salt and pepper, it gets a little sweeter and caramelized on the edges. I personally love the bitter flavor as a contrast. Get a little bit of everything in one bite, and it’s a great combination of crunchy, bitter radicchio, moist chicken, acid from the lemon and fresh, herb-forward dressing. I made this for my girlfriends Kim and Shahnaz for a night of reality TV indulgence, and paired it with a potato salad. It was a hit. I also love the family-style presentation — reminds me of my family’s dinner table growing up in New Hampshire. Enjoy! I had a bunch of chicken drumsticks in the freezer, so instead of using a full chicken, I just used the drumsticks instead — it worked great! Same thing if you want to use up some thighs, etc. Personally, I think it’s a pain to cut up a whole chicken and I’ll avoid it by buying it already separated. I don’t have a grill (I know, I know, workin’ on that) so I just used my trusty grill pan and another skillet side-by-side on the stovetop. A little bit of a hassle, but worth it. I didn’t want to heat up my whole oven to roast the garlic, so instead I used my toaster oven — the perfect solution. When you quarter the radicchio, don’t core it — the core will hold the leaves together while you grill it. You can core it once you’re done grilling, and you’ll want to — the core is tough and inedible. Preheat the oven to 400 degrees F. Cut a piece of aluminium foil about 12 inches long. Then put the chicken on the grill, skin side down, and grill. Grill the chicken for about 20 minutes, turning once, then baste with about half of the vinaigrette and keep cooking until an instant-read thermometer stuck into the thickest part of the thigh reads 160 degrees F and the chicken is nice and caramelised all over, 15 to 20 more minutes. During the last few minutes, throw the lemon halves on the grill, cut sides down, and cook until just marked and smoky. Why a martini? This dish has big flavors that would stand up to it. The steak is hearty and delicious, cooked to a perfect medium rare. And the pasta is quite the accompaniment. 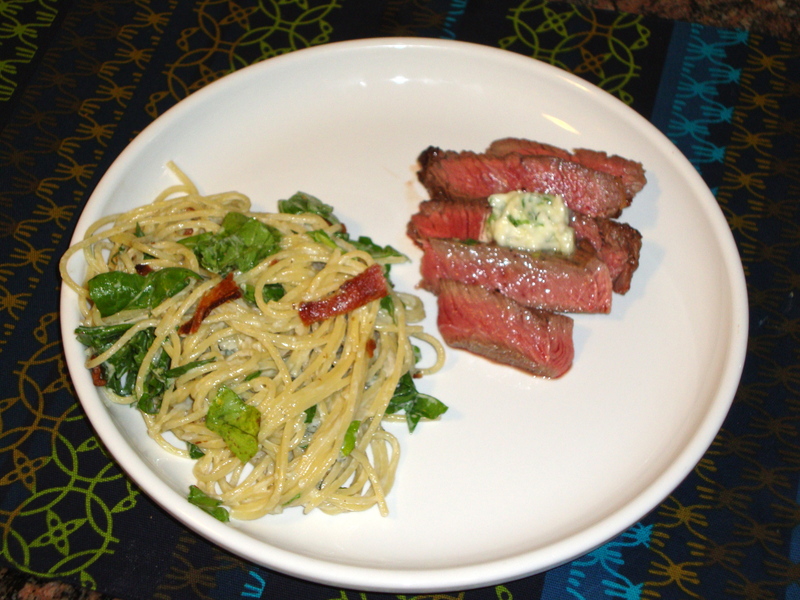 The blue cheese is bold and pungent, and once you add in some spicy arugula and top the pasta with bacon, it packs even more punch. The garlic chive butter to top the steaks makes a lot — wrap the extra in plastic wrap and put it in the fridge to use later on veggies or warmed up bread. I’d cut the pasta in half — it makes a TON and it’s really rich, so I ended up having to throw a lot of it away. And, it’s better when you first cook it, versus reheated. Put a large pot of water on the stove to bring to a boil for pasta. Preheat broiler to high with rack on top shelf. Preheat medium skillet over medium-high heat. Add chopped bacon and cook until crisp. Salt water for pasta and add spaghetti to the pot. Cook to al dente, with a bite to it. 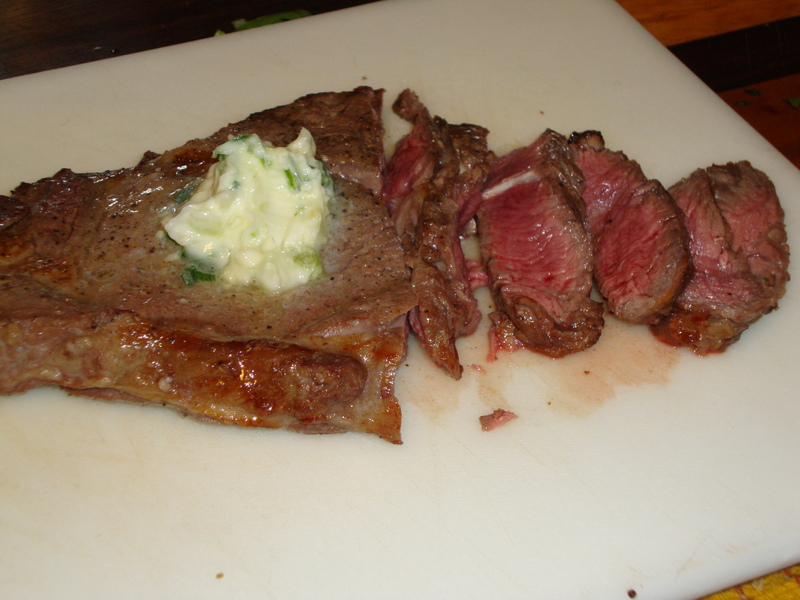 Season the steaks with salt and pepper on both sides and arrange on slotted broiler pan. Remove bacon to paper towel lined plate with a slotted spoon and drain off most of the fat, return pan to heat and reduce heat to medium. Add extra-virgin olive oil, 2 turns of the pan and 1 tablespoon butter. When butter melts into extra-virgin olive oil, add in 2 cloves garlic and the shallots, saute for 3 minutes. Arrange steaks on the broiler pan. Place under broiler – leave door to oven cracked ajar to limit flare ups and smoke. Cook 4 minutes on each side for medium rare, up to 5 to 6 minutes on each side for medium well doneness. To the garlic and shallots, add in flour and cook a minute more. Whisk in stock, bring to a bubble, about 30 seconds then stir in the cream. When cream comes to a bubble, add in blue cheese and sage and a few grinds of black pepper. Stir until cheese melts. Reduce heat to lowest setting. Soften 4 tablespoons butter in microwave on high for 15 seconds. Mix in chives and 2 cloves minced garlic and reserve. Remove steaks from oven and let rest 5 minutes. 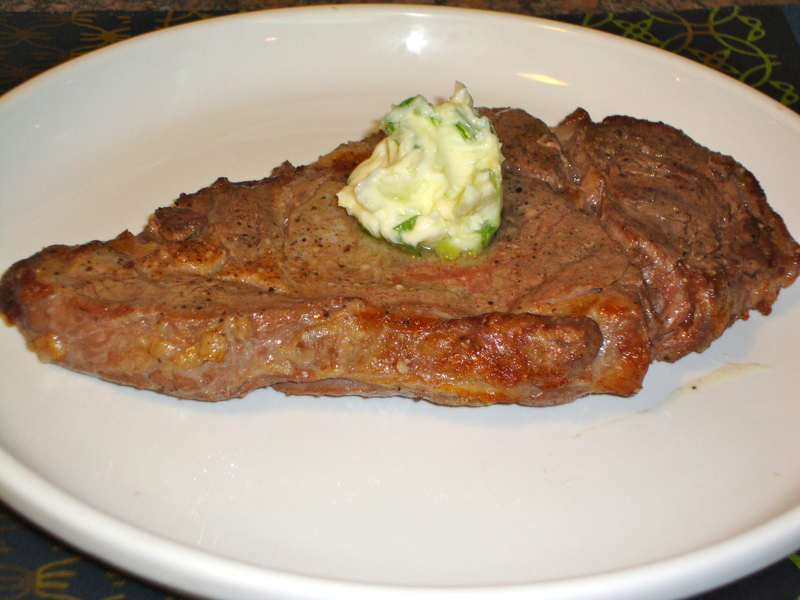 Place 1/4 of the chive and garlic butter mixture on each steak to melt down over the meat as they rest. Drain pasta and toss with sauce to coat and combine evenly. Taste to adjust seasoning. 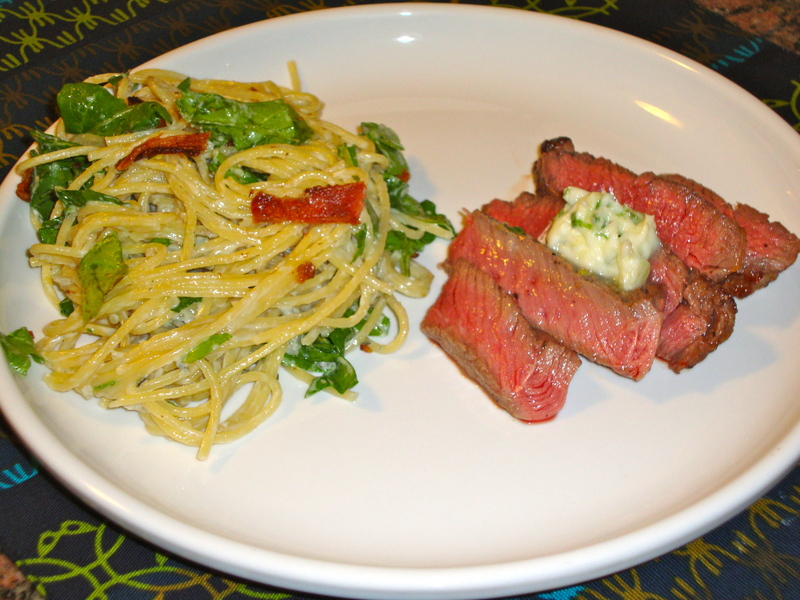 Serve steaks with pasta alongside. 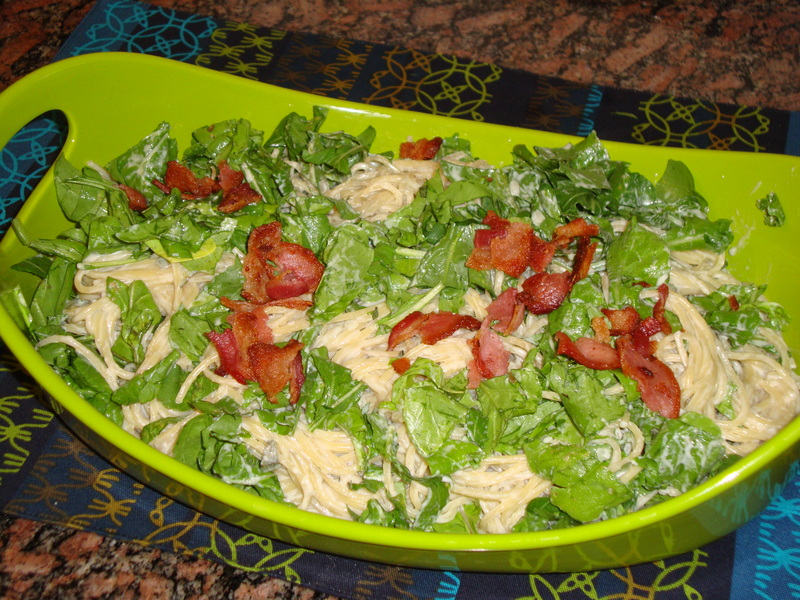 Scatter the arugula and bacon bits across the top of the pasta.